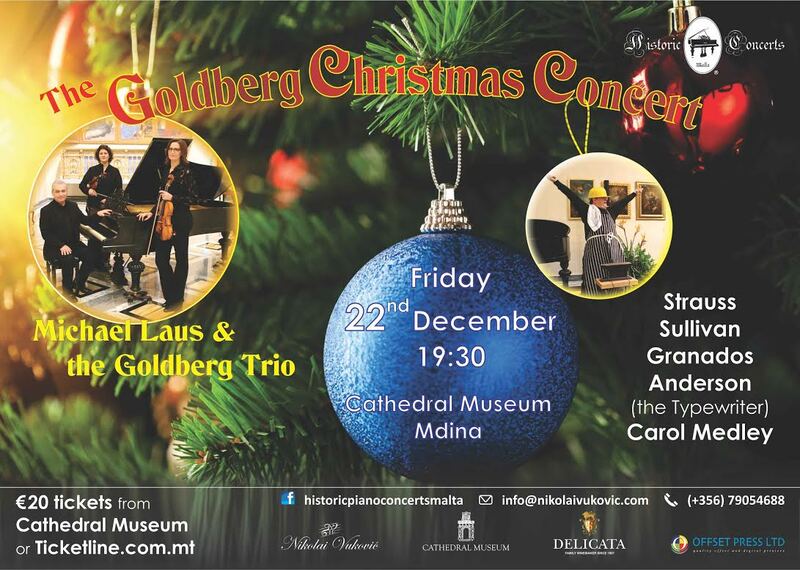 The Goldberg Trio is back at the Cathedral Museum, Mdina for a most-entertaining concert tailored for the festive season. The trio is made up of foremost Maltese musicians from the Malta Philharmonic Orchestra: Michael Laus (Resident Conductor & Pianist), Marcelline Agius (Orchestral Leader) & Nadia Debono (Principal Violist). The trio will be joined by Stephen Zammit, also from the Malta Philharmonic Orchestra, for a most amusing performance of Anderson’s “The Typewriter“. A Christmas Carol Medley has been specially arranged for the concert by Michael Laus for the audience to sing along. Following the concert, patrons will be treated with mulled wine and delicious homemade mince pies. This concert is particularly appealing to all ages. Historic Piano Concerts offers a unique classical music experience through the combination of top musicians; one of the most inspiring and authentic-sounding pianos on the island – a historic A.D. 1890 Blüthner piano; and a stunning venue – The Cathedral Museum, in the heart of Malta’s Medieval City of Mdina.